This survey explores how consumers read and use online reviews. The information contained in this survey helps businesses and digital marketing agencies qualify the value of consumer reviews and how reviews impact consumers’ opinions and actions when searching for local businesses. 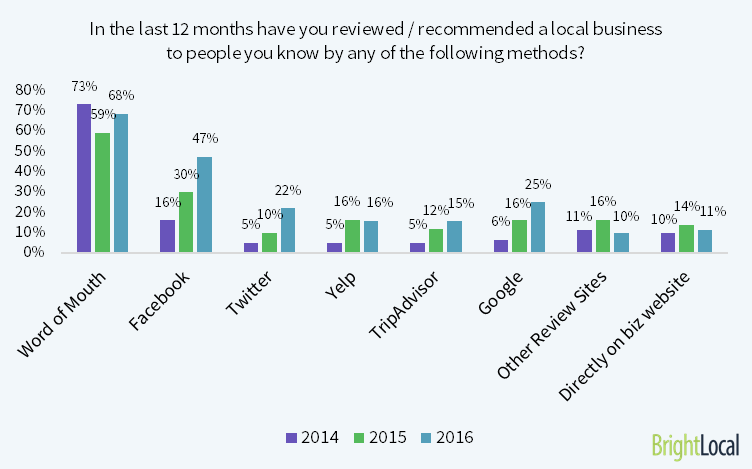 The findings of this survey are specifically concerned with reviews for local business services and not general product reviews. The Local Consumer Review Survey was first conducted in 2010. Since we started running the survey we’ve seen see a dramatic shift in how consumers search for local businesses and the role that online reviews play in consumers’ research and decision-making process. This year’s survey has evolved from 2015 with some variations on the questions asked. There are new questions, modified questions and certain questions have been removed which are no longer relevant or useful for SMBs and SEOs. In September 2016, we reached out our US-based consumer panel and 1,062 individuals completed the survey. To provide a perspective on trends over time, we compare this year’s findings vs 2015 and 2010 data where applicable. Why Are Consumer Reviews So Important? A positive online reputation is one of the most powerful marketing assets a business has to convince new customers to contact them. The social proof contained within reviews and star ratings helps consumers short cut their research and make decisions faster and with greater confidence than ever before. In follow-up to this survey, we published research that studies the impact of positive star ratings and reviews on both Search Click Thru Rates and Landing Page Performance. These findings, coupled with the results below, show that online reviews can impact local search rankings and creates a hugely compelling argument for why SMBs should invest more in reputation marketing. How many times have you used the internet to find/search for a local business in the last 12 months? Do you read online reviews to determine whether a local business is good or bad? How do you typically find online reviews? How do you typically find online reviews? Which of the following devices have you used to read reviews for a local business in the last 12 months? How many different review sites (eg: Yelp, TripAdvisor) do you look at before you make a decision about a business? For a local business, how recent (i.e. current) does an online review need to be to impact your decisions? For which of these local business types does ‘Reputation’ matter the most when choosing a business? 1. 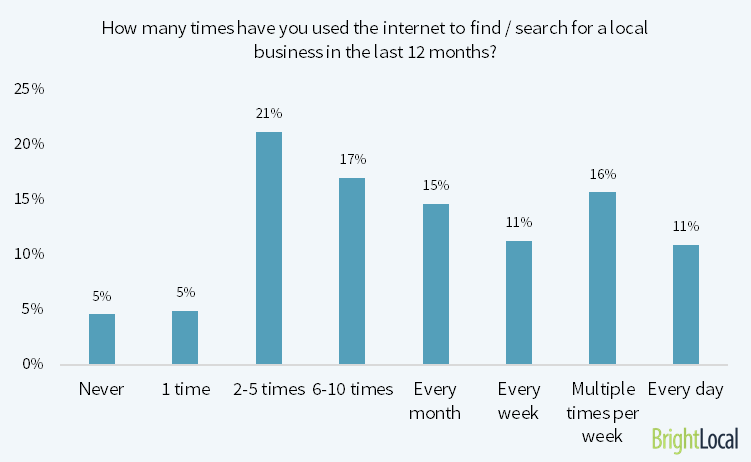 How often do consumers search for local businesses online? This question helps determine how active consumers are at searching online for local businesses. The majority of consumers search for a local business on a regular basis with 53% of people searching at least 1-time per month (vs 42% in 2015). Conversely, there is a significant decrease in the number of people who never search for a local business online – now just 5% of people. 2. Do consumer read online reviews to judge whether a local business is good or bad? More consumers are reading online reviews and on a more frequent basis. This ties in with the increase in consumers searching online for local businesses; and when they search they often see reviews and review sites included within the search engine results or in Google’s Knowledge Panel. So there is a correlation between more searches and greater attention/reading of reviews. 91% of consumers now actively read online business reviews. This means more and more people are searching for and reading reviews on a regular basis. This demonstrates that there is an increasing habit among consumers to proactively look for reviews – which is encouraging for businesses who have a positive online reputation. It also appears that Google is placing more emphasis on reviews and ratings. They recently took the step to reference reviews and ratings from third-party review sites within the Local Knowledge Panel, alongside reviews from Google My Business/Google+. This is a significant shift with Google showing that they appreciate the importance and significance of online business reviews. 3. How do consumers typically find online reviews? **This question is new to 2016 so there is no comparable data from previous years. People surveyed were allowed to select more than one answer. The data was adjusted for this and we also deleted the people who don’t read online reviews from the data. Search engines are the preferred method for finding online reviews — 63% of consumers surveyed said they turn to a search engine, like Google, Bing, Yahoo!, to find online reviews for local businesses. Because review sites and ratings are often displayed in search engine results pages, it’s possible that a percentage of the people who said they go directly to a review site do so by clicking on the review site listing in search results. 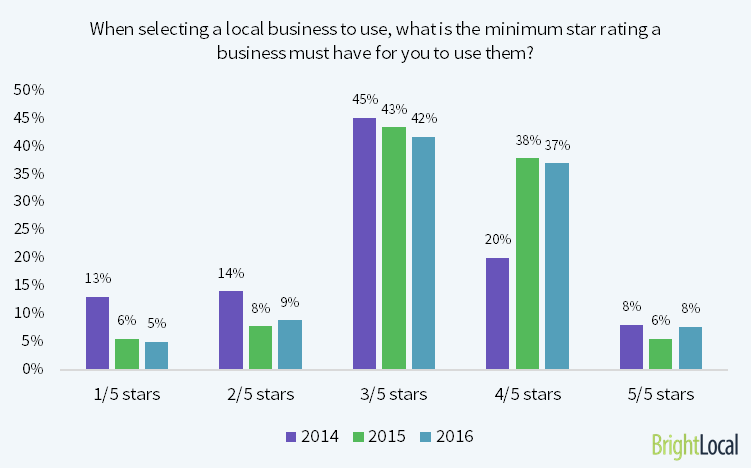 Regardless, these numbers show that having a local business listed on popular review sites and proactively growing consumer reviews is crucial for an SMB to attract new customers online. 4. Which devices do we use to read consumer reviews? 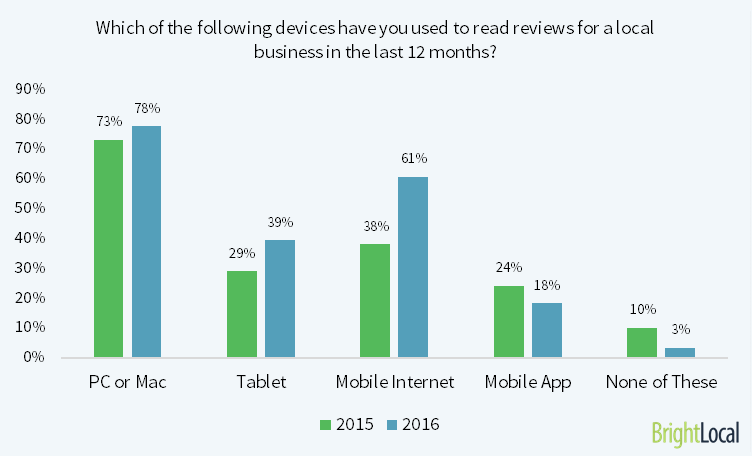 The majority of consumers search for local business reviews on a personal computer (PC), but mobile devices also prove to be a popular way to read reviews. Mobile devices let consumers search for local business reviews wherever they are, at the exact moment they need or want the business’ information. Respondents to this question were allowed to select more than one answer. The findings show that over 50% of people use more than one device to find/read online reviews. Local businesses will benefit by having online reviews on a variety of review sites, such as TripAdvisor, Foursquare, Yelp and others. Additionally, getting reviews on other platforms, like Google My Business/Google+ and social media platforms, like Facebook, diversify where a business’ reviews appear and can increase the chances to show up in search results. Interestingly the percentage of consumers reading reviews via ‘Mobile Internet’ (61%) is significantly greater than those using Mobile Apps (just 18%). In fact the number of consumers saying they accessed reviews by mobile apps dropped by 6% from 2015. This is most likely due to improved usability in mobile browsers and also because browsers are built into mobile device so all users have internet access on their mobile devices. Whereas you need to proactively download apps (like Yelp) to use them and a much smaller number of users will do this. On a broader SEO note, the results highlight further the increasing use of mobile search by consumers. To capitalize on this, local businesses must ensure that they have a solid online presence — no matter what device a consumer is using. That means ensuring they have a website that is engaging, impressive and contains answers to the questions that people are searching for (i.e. uses the right keywords and content.) Additionally, a mobile-friendly website is no longer optional – it’s mandatory. 5. What type of businesses do consumers read online reviews for? For this year’s survey, we adapted the business categories used so they mirror the most common categories that appear on review sites. 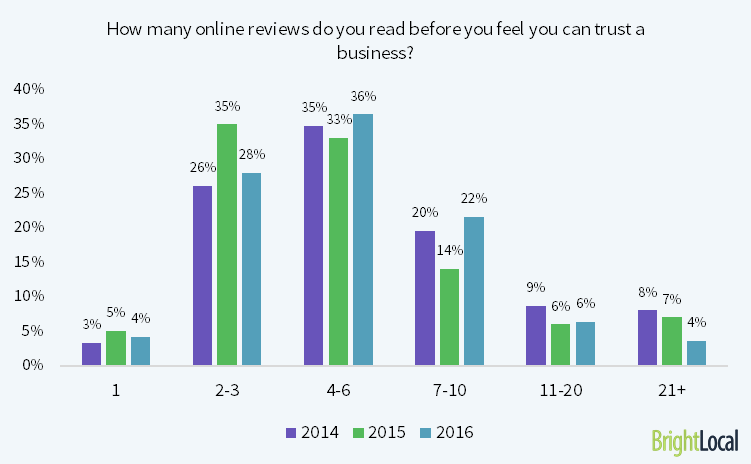 Overall, the results show that the most popular types of business reviews have not change radically since 2015. Restaurants, Cafes, Medical, Health Care Professionals, Clothing Stores, Hotels/Bed & Breakfasts and Automotive Services are the key businesses that consumers are interested in reading reviews for. However, these numbers do depend on the business type and how frequently consumers need to use that type of business. For instance, businesses that consumers use more frequently are likely to have more reviews, and those reviews are read more often by consumers. But it’s important to remember that consumers still read reviews for locksmiths, accountants, pest control companies, etc., but because these services are not as regularly needed or used, those reviews are not looked up or read as often. 6. How many consumer reviews do we read before we can trust a business? Consumers form opinions about a business faster than ever with 68% forming an opinion by reading just 1-6 online reviews. Almost 9/10 consumers determine whether or not they can trust a business after reading just 10 reviews – this number should be the benchmark for SMBs/SEOs to aim for so they appeal to a broad set of consumers. To remain relevant to those large percentage of people who read reviews, businesses must have a reputation strategy where they monitor what customers are saying about them, and also have a system which proactively get positives new reviews from customers. Why? Well, when researching a business, most consumers look at the top reviews first. If the recent reviews are negative ones, that can significantly impact a consumer’s trust and they may not read past the negative reviews – even if there are many positive reviews just below. Therefore, it’s important to monitor reviews regularly and focus on generating regular, positive reviews so that bad reviews are pushed down further on the list. Many business owners don’t want to “deal” with reviews or think online reviews don’t matter. They’re often afraid of receiving negative reviews. The reality is this: People are going to leave online reviews about your business – whether you want them to or not. It’s best to be proactive and not reactive. Businesses should also see reviews as an opportunity to engage with their customers and get honest feedback about their business. Simply asking a client or customer for a review is easy. Here’s a recent and very detailed blog post that discusses the importance of reputation marketing for SMBs. 7. How many different online review sites are looked at before a decision is made about a business? *This question is new to the survey in 2016. The answers to this question will vary depending on the type of business or service someone is researching. For instance, if a person is looking for a restaurant, they may only check out one or two consumer review sites. However, if they want to hire a contractor to refurbish their house or need a cosmetic dentist then it’s more likely & probable that they will look at more review sites. The depth of research is dependent on the value vs. risk vs. the importance of the purchase being made. 8. 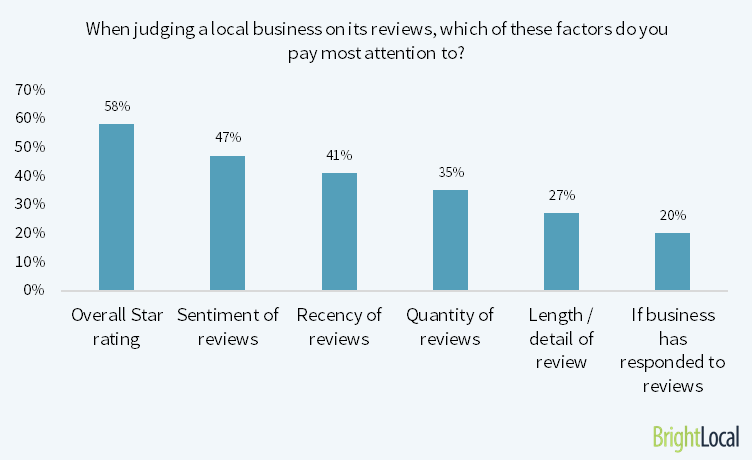 When judging a local business on consumer reviews, which factors are most important? **Respondents who didn’t read reviews have been removed from this data. This is a new question to this year’s survey. When evaluating a business’ online reviews, the most important factor to consumers is the average or overall star rating of that business. Star ratings are ubiquitous and widely understood by consumers. We all know that 5 stars is better then 4 stars and so on. High-star ratings imply a higher quality business. The star ratings are a universal score that everyone understands. It distils the quality and social proof of a business into a single, easy-to-understand and easy-to-compare score. The star rating system requires little effort to understand and helps consumers assess a business in a matter of seconds – which is a huge time and effort saver. However, there are other factors that people consider to get a holistic view of a business’ reputation. Other important factors are the sentiment of reviews (i.e. positive or negative comments and statements) and the recency (aka ‘age’) of reviews. For instance, if a business has four 5-star reviews but these reviews are three years old, then the consumer will probably devalue the importance of the overall star rating because they’re looking for more current reviews. Surprisingly, the quantity of consumer reviews came in at the #4 position — beneath sentiment and recency. Many people assume that the more reviews you have, the better your business will be perceived. According to the consumers surveyed, they care more about the sentiment and recency of the reviews than the total number of reviews a business has. Interestingly, 9% of consumers say it’s important that a local business respond to the reviews their customers leave online. While this is the lowest factor scored, it does show that consumers do care if a business takes the time to respond to a review. 9. When selecting a local business, what is the minimum star rating consumers will consider? Consumers see star ratings as the most important factor when deciding what business to use. For instance, 45% of consumers won’t consider using a business with 1-3 stars. Essentially, if a consumer sees a business with 1-3 star ratings, they consider that to be a poor quality business. But if a business has a 4 star rating they jump in their appeal with just 8% of consumers considering this to be not good enough! Consumers consider star ratings as an important factor in deciding what business to use, but consumers are also realistic about businesses and very few (8%) expect a business to have a 5-star rating before they will consider using them. Most people know that no business is perfect and that everyone has an “off” day. These statistics serve as a useful guideline for SMBs and SEOs, as well as a reminder of just how important star ratings and positive reviews are. 10. For a local business, how recent do consumer reviews need to be to impact decisions? Recency of reviews matter to consumers with 22% wanting to see consumer reviews from the last two weeks. Having a steady stream of recent reviews is important for local businesses. Consumers want to see new reviews so they reflect the business/service as it is today – not 2 months ago or 1 years ago. If a consumer sees reviews that are more than a year old, those reviews will have less impact on their buying decisions than reviews written just last month or last week. However, it’s important to note that the type of industry makes a difference. For instance, restaurants should get reviews frequently due to the number of people that come in and out of a restaurant. Accountants can have a longer time period between reviews due to the consumer’s “need” for an accountant (i.e. tax season). Additionally, an important part of the customer review process involves the customer “experience” at the business. Some businesses change and evolve faster than others. High-turnover businesses such as restaurants & hotels tend to have higher staff turnover and the quality of service is directly affected. Therefore consumers need to see recent reviews for these businesses. Whereas an accountant or dry cleaner is less volatile, so older reviews retain their relevance to current service quality. 11. How do online consumer reviews affect your opinion of a local business? **Consumers were allowed to select multiple answers. The key takeaway is that positive reviews help impart trust to consumers, while negative reviews put consumers off. Big surprise right?! Since reviews have such an impact on consumer attitudes, businesses should actively look to grow their positive reviews and be proactive in managing any negative reviews they receive. 12. How do online consumer reviews influence your decision to actually use a local business? **Consumers were allowed to select a maximum of two answers. We added in ‘Negative Reviews’ option into 2016 survey for the first time. Positive reviews make people more likely to use a local business. For business owners, this means that earning positive reviews from their existing customers can help them win new customers in the future. Additionally, 24% of consumers say that negative reviews make them not want to use a business. These figures combined show that people seriously consider reviews when making a purchasing decision. People trust consumer reviews more than ever with 84% saying they trust reviews as much as personal recommendations. That said, there is still some skepticism among consumers. 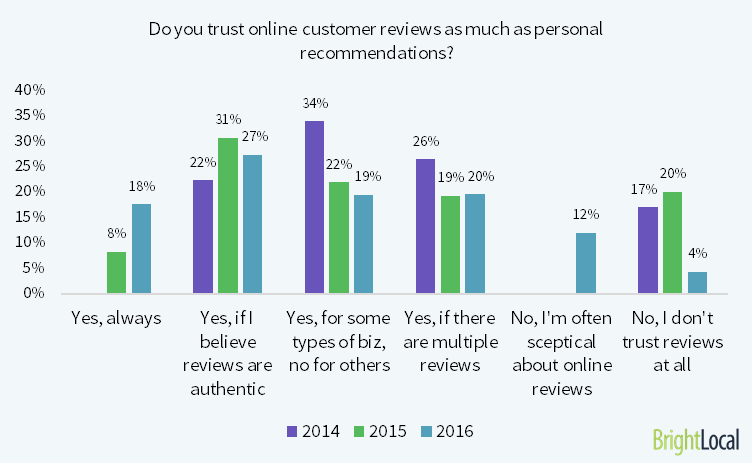 Consumers are concerned about fake reviews; 27% of people will trust reviews only if they believe they are authentic (vs 31% in 2015). The authenticity of the reviews is an important factor as people are reading reviews. If consumers get a sense that a review is “planted” or “seems too good to be true,” they will take that into consideration and that review may sway their decision. 14. When you read positive online reviews for a business, what is the typical next step you take? By far the most common next step for consumers who read reviews is to visit the business’ website (54%). This isn’t surprising because the consumer is already online and typically there’s a link straight to the business’ website from most review sites. This information does reinforce the need for every SMB to have a website. Only 19% of consumers say their next step after reading positive reviews is to visit a business’s premises. Obviously this will vary depending on the type of business a consumer is looking for – if it’s a restaurant or a local shop, it will be higher; for a gardener or wedding planner then it will probably be lower. 17% say that they will look for more reviews about the business they are considering. This is important because it shows the level of trust a consumer has in a business. If they continue to look for reviews, then that means they are not yet convinced and need more convincing before contacting the business. Only 7% of consumers will contact the business next. This figure would probably be higher for those searching on a smartphone (vs. a PC) because it’s easy to use the click-to-call feature to contact the business directly and ask any questions they may have. Again, this would depend on the type of business a consumer is looking at. Overall, it’s clear that consumer preference is to visit a business’ website next and learn more about that company before contacting them. This highlights how crucial it is for a local business to have a website that showcases their quality of products and services, provides content that a consumer may be searching for and contains a variety of links that users can easily click on to find out additional information. One of the most important things is to have an easy-to-find “Contact Us” page that lists the business’ Name, Address and Phone Number (NAP) and email address so it’s easy for potential consumers to contact the business when they are ready. 15. For which of these local business types does ‘Reputation’ matter the most when choosing a business? For some types of businesses, reputation is more important than others. Restaurants/Cafes, Hotels/Bed & Breakfasts and Medical professionals should pay the most attention to their online reputation. But reputation is important for every business. The numbers reflected in the survey depend on what a consumer is most interested in at that particular time. For instance, if a person has an ageing parent and they are looking for a senior living home for them, the Senior Living Facility reviews will matter most to them. 16. Have you ever been asked by a business to leave an online review for them? 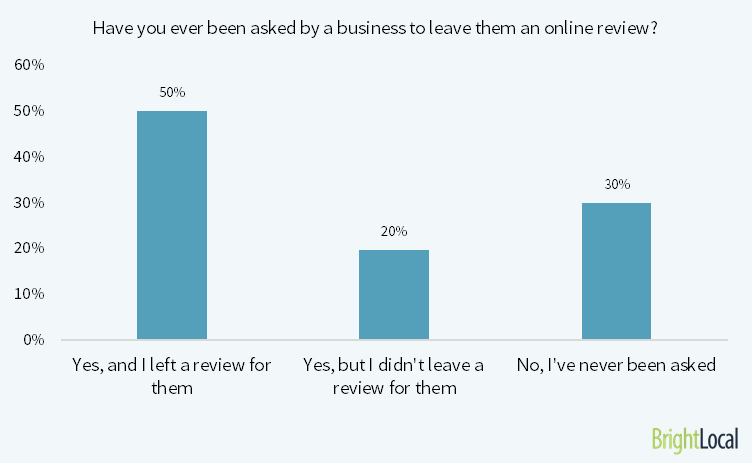 This is a crucial point: If asked, 50% of consumers will leave an online review for a business. This reinforces the need for virtually every business to have a reputation marketing strategy. It’s important for businesses to start asking for reviews from their customers, but they must do so with caution. Here’s why: If a business gets too many reviews in a short period of time (on Yelp, for instance), the review site’s algorithm can see that as being suspicious activity and can suppress some or all of those reviews. This is especially true if you’ve never had reviews posted about your business before. Ask for consumer reviews gradually, a few customers at a time, and monitor the growth of reviews. Additionally businesses should never pay for or otherwise incentivize consumers to leave reviews by offering money or cash off. (That’s considered unethical.) There are some experts that say that being entered into a contest in exchange for a review is acceptable, but double check with your state’s laws and do your research to find out best practices. Additionally, never tell a consumer that they HAVE to leave you a good/positive review. You don’t want the customer to feel pressured or pushed into leaving a 5-star review if they think that your business could do things better. Companies should take the feedback they get — positive or negative — and use it to make their business better. 17. In the last 12 months have you reviewed/recommended a local business to people you know by any of the following methods? Word of mouth is still the most popular method of recommendation for consumers. It jumped from 59% in 2015 to 68% in 2016. Social media reviews have increased as well over the last year. Facebook reviews are extremely important to a business’ reputation marketing plan. Because Facebook is growing so fast and there are high levels of engagement, getting reviews on Facebook can help spread the good word about your business — fast! Facebook has a huge audience reach that you should take advantage of to promote your positive reviews through social media posts and shares. Twitter also experienced significant increases over the 2015 survey. Social media platforms will probably become a regular medium for people to use to recommend businesses to other consumers.